Communism is a precognitive hypothesis about a classless, moneyless, stateless society which includes a social order structured upon common ownership of material resources, and an ideology pervading social, political and economic spheres that aims at the establishment of this social order. Communism denies God, religion, and tradition. Accepts culture selectively, experiments with family system and strives towards revolution leading to establishment of a communist government. Mao substituted the the peasantry (discounted by traditional Marxists) for the urban proletariat that China largely lacked. This substitution brought Mr. Mao Zedong to power in China through violent insurgency by Chinese agrarian peasants. Maoism was embraced by insurgent guerrilla groups worldwide; under the Khmer Rouge it became Cambodia’s national ideology. Naxalites and Maoists of India are insurgent groups inspired by Marxist-Lenist-Maoist ideas and adopting violent confrontation approach towards the government and society. Left Extremism in India is steadily gaining strength and Maoists are able to establish their presence along a strip across the country called Red Corridor. The Red Corridor is a region in the east of India that experiences considerable Naxalite–Maoist insurgency. The axalites group mainly consist of the armed cadres of Communist Party of India (Maoist) (CPI (Maoist)). These are also areas that suffer from the greatest illiteracy, poverty and overpopulation in modern India, and span parts of Andhra Pradesh, Bihar,Chattisgarh, Jharkhand, Madhya Pradesh, Orissa, Uttar Pradesh and West Bengalstates. A manual titled “Strategy and Tactics of the Indian Revolution” prepared by Leftist extremists states the goal explicitly. The aim is to overthrow the Indian State. The plan is not to take up this objective tomorrow or day after. The strategy is to prepare the ground and make preparations to overthrow the State around 2050. There are some documents talking of 2060. The objective for 2010-2020 is not to initiate a decisive war against the armed forces. It is a long steady progress. In Chhattisgarh, local tribals facing the brutality of Maoists, responded with a resistance movement equipped with arms. The resistance movement (called Salwa Judum) was very effective and the state government extended its support to the movement and provided formal training to the members of the resistance movement. 1. Updates about Christianity, especially relevant to India. 2. Discuss proselytization in the context of a multicultural society. 3. Provides an understanding of colonialization and its effects on Indian society. 1. Provide clearer understanding of followers of Islam and their critics. 2. 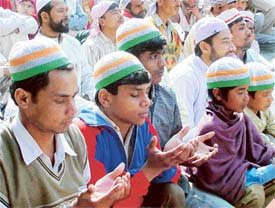 Promote peace, and social harmony in Indian subcontinent. 3. Provide pointers to quality web sources related to Islam. 1. Set out clear objectives for a debate, or for an initiative. 2. Provide valid information, arguments and insights leading to the realization of objectives. 3. Provide pointers to web sources to help sustaining meaningful perspectives. Kashmir is a long standing security concern for India. Pakistan is waiting for a suitable opportunity to annex Kashmir. Unrealistic assessment of Pakistani establishment has been exposed in previous wars – but Pakistani society as a whole has not learnt any lessons so far. kashmir-medsyn : a blog on Kashmir by media.syndicate. Intended to individuals who would like to take a sensible stance on History of Kashmir, disputes around the region and proposed newer arrangements. Kashmiri Shaivism – Vaideeka philosophy taught by teachers from Kashmir – Abhinavagupta, and Jayaratha.